So another year draws to a close. I'm sorry to see the end of 2012, which for me was an extremely enjoyable year for a whole range of reasons. I didn't have a new novel published, or a new anthology out, but both these omissions should be put right next year. And there was, in fact, a lot of activity on the book front, with six Harry Devlins coming back in from the cold as ebooks, with added features, including introductions from various writers more eminent than me. The reappearance of my debut novel, All the Lonely People, as an Arcturus Crime Classic, also gave me a real thrill. This was the year when I made a start on improving my work-life balance, or at least the balance between the time I spend on writing and the time I spend as a lawyer. I'm still some way from getting the most out of the change, but things are definitely moving in the right direction. Who knows, I may finally get going properly with Twitter before too long. I read some marvellous books over the 12 month period, but I'm going to wimp out of making a list of the better ones. Of new or newish books, I'm tempted to nominate Finders Keepers by Belinda Bauer as, if not "the best" of the bunch, then certainly one that has lingered long im my memory. Among novels by friends of mine, it's almost impossible to choose, but Ann Cleeves' The Glass Room was a very enjoyable homage to the Golden Age.Which leads me on to older books,and here again,selecting one out of many seems invidious. Two obscure titles, The Grindle Nightmare by Q. Patrick (thanks to John Norris for supplying my copy) and Nightmare by Lynn Brock were, in their different ways, unexpected and excellent. The most fascinating non-fiction book I read was Curt Evans' book about the so-called "Humdrum" writers; his diligent research has certainly helped me a great deal in my own researches, and his enthusiasm for previously under-valued writers like John Rhode is noteworthy. Geoff Bradley and Arthur Vidro continue to edit excellent fan magazines on either side of the Atlantic, and I contributed a couple of articles to Mystery Scene, a really terrific crime magazine which is sadly hard to find in the UK, but well worth seeking out. Best film just had to be Skyfall, which I've only just seen. Expect a rave review shortly. Best TV crime show - Sherlock, quite outstanding. I enjoyed the CWA conference in Southampton, the Northern CWA's 25th anniversary shindig in Pickering, Crimefest and Harrogate, as well as a trip to Agatha Christie's former home at Greenway along with Christie expert John Curran (whose recommendations of good books and films have led to a lot of enjoyment.) The Kidwelly e-festival was also very memorable, though for rather different reasons. Quite apart from trips on research to the Lakes, I visited new places as different as Ely, Madeira, Almeria and Kotor, at least one of which will be featuring a short story before long. The picture at the top of the post was taken in Gibraltar, the one beneath it at a street party that was very enjoyable but as close as I got to any real involvement with the Diamond Jubilee, let alone the Olympics (for me, it was a great sporting year for other reasons, because Manchester City and Derbyshire County Cricket Club for once found out how to win a championship!). In addition, I had the great pleasure of staying with a crime fan and his wife for a couple of days in a house with the most stunning collection of rare Golden Age books that I've ever seen. He's even loaned to me some of the rarities I've reviewed, a kindness I much appreciate. Each year always has its sadnesses as well as its joys. The loss of Reginald Hill and Margaret Yorke was extremely sad, as was the recent death of Maxine Clarke. All three were generous people and Reg had a significant influence on my career. And that matter of generosity prompts my final reflection of 2012. Maxine is one of quite a number of people I've been lucky enough to get to know as a result of writing this blog, and I've gained a great deal from those of you who read my posts - and not just those of you I've met in person. Your feedback and support has given me a great deal of pleasure, and I hope to return the compliment by coming up with some interesting topics for you to chew over in 2013. May it be another memorable year for all the right reasons. After a couple of Forgotten Books last Friday as a bonus, plus today's, the series will resume next year! Today I'm linking to a guest post about my next book, The Frozen Shroud, which I've contributed to an excellent collective blog, Murder is Everywhere. My thanks again to Stan Trollip, one of the many pleasant people I've come to know through attending crime conventions. They really are very convivial events, and for anyone who is a crime fan but has never attended a convention, I do encourage you to make a resolution to give it a go if you can in 2013! I've mentioned Helen McCloy a number of times in recent months, and I was delighted to read another of her excellent mysteries, Through a Glass, Darkly, now reprinted as an Arcturus Crime Classic, which is my Forgotten Book for today. Again it features her amateur sleuth Basil Willing, a likeable psychologist, whose girlfriend introduces him to a strange puzzle. Faustina (great name!) Coyle is a young teacher in her first term at an exclusive girls' school, Brereton. As the book opens, the head teacher, Mrs Lightfoot, is giving her the sack - but not giving her a reason. Something very strange is clearly going on - but what? Faustina briefly contemplates taking legal advice (the employment lawyer in me was naturally enthralled!) but decides against it. Instead, she confides in her friend and colleague Gisela, who in turn consults Basil. There is a creepy atmosphere about this story which adds to its power. What on earth is going on? Can it be that Faustina really has a mysterious double, and is she - or rather, the double - in some way responsible when another colleague dies? The power of McCloy's stories derives from the fact that not only was she very clever in the way she plotted, she also wrote lucid and compelling prose. Every now and then, she digresses into delivering a chunk of information that may not always help the pace of the scene, but it's usually interesting information. Clearly, she was a highly intelligent person and I imagine her as an interesting woman to talk to. An intriguing feature of this novel is that it is, in fact, an expanded version of a short story that appeared twelve years before the book's publication in 1950. I read the story a long time ago, but had forgotten the solution. And although there is only a restricted pool of suspects,and you may think that the culprit is over-reliant on chance, McCloy writes so engagingly that reservations are quite easy to put aside. A genuine crime classic.. Restless, a BBC TV two-parter which began this evening is based on a novel by William Boyd, and benefits from a marvellous cast, including Hayley Atwell, recently impressive in Falcon, as well as the eternally entrancing Charlotte Rampling. Add in (among others) the excellent Rufus Sewell and the magnificent Michael Gambon, and you were almost guaranteed something watchable. And Restless certainly was watchable. Even its sedate pace (perhaps a total of three hours is more than strictly necessary to tell the story?) was fairly appealing. So were the various scenes in Cambridge, one of the most photogenic of cities. It's also a city associated with spies, of course, and Rampling played Eva, who in the 1970s reveals to her daughter that she has another identity; the woman her daughter knows was created when Eva was persuaded to join a branch of British Intelligence at the start of the Second World War. There are two stories: first, what happened to young Eva (Hayley Atwell) during her career in espionage, and second, what happens to Eva in later life.Tension in the latter story-line builds because Eva is convinced that someone is out to kill her. Why this would be, after so many years, is the great mystery of Restless. I'm hoping for a strong and convincing explanation. Although I have never been tempted to write a spy story, I do rather enjoy them, if they are well written. Spies trade in secrets, and secrets are always interesting. I used to enjoy Michael Gilbert' spy novels, and his stories about Calder and Behrens, for instance; they deserve to be better known. I haven't read Boyd's book, but the screenplay has me engaged, and I'll be watching episode two for sure. Doors Open, a TV film based on Ian Rankin's novel, was ideally suited to a screening on Boxing Day - a light and very entertaining thriller, involving an art heist and benefiting from an excellent cast. Three friends, played by Stephen Fry, Douglas Henshall and Kenneth Collard, have varying motives for indulging in an amateur robbery on a grand scale - the theft of valuable paintings from a bank vault. The trio soon realise that they need professional help, and - needless to say - this is where things start to get tricky. For the career criminal who helps them out is in hock to a nasty English gangster, who is all too ready to take ruthless revenge if he is not paid back what he is owed. The complications increase because Henshall's character is still emotionally involved with a former lover (played by Lenora Crichlow), who just happens to have been brought in to assesss the bank's collection of art before it is sold off. I've been a fan of Ian Rankin since the early 90s, when I read his first Rebus novel. A few years later, I was delighted to receive from him a contribution to the first CWA anthology I edited, Perfectly Criminal. The story, "Herbert in Motion", won him a Dagger,and that, too, concerned an art theft. So Doors Open had, for me, an added interest. The jaunty and sometimes obtrusive soundtrack emphasised, perhaps too insistently, that this was a "feelgood" show rather than anything serious, but I found it very enjoyable, even down to the finale, which borrowed a device used in Christie's Why Didn't They Ask Evans? and other Golden Age stories. The acting was good, and there were some funny lines (including reference to the ultimate feelgood heist movie, The Italian Job). When last seen, Henshall was playing the deranged villain of The Secret of Crickley Hall. Soon he will morph into Jimmy Perez in Shetland. He's becoming almost as ubiquitous as - well, Stephen Fry. My thanks and very best wishes go to everyone who has read this blog during the past year. May you have a wonderful and peaceful time. I'm very grateful for the kindness so many of you have shown me in 2012 and it's been a great pleasure to meet quite a number of you in person, as well as through cyberspace. Speaking of which, someone I very much enjoyed chatting to over dinner at Crimefest in May was Stan Trollip, one half of the writing duo Michael Stanley, and he's kindly given me a slot on the terrific Murder is Everwhere blog this week. All being well, I'll be linking to the post on Thursday. Thanks, Stan! The Secret Life of Wallander, by Stafford Hildred, is sub-titled ‘An unofficial guide to the Swedish detective taking the literary world by storm’. To anyone of a slightly cynical turn of mind (like me) the key word there is probably ‘unofficial’. The author is a successful journalist, whose other books have featured the likes of David Beckham, Rod Stewart and Jamie Oliver, and he writes as an enthusiast rather than as a crime fiction specialist. The book seems to have been quite hastily written, and I spotted a few oddities and errors, plus a regrettable absence of a detailed list of sources and an index, that one tends to associate with quickly produced ‘scissors and paste’ books. I do miss an index in a non-fiction book - though when, years ago, I had to compile my own index to a legal book I'd written, I did not enjoy the task at all! Despite the shortcomings of this project, Wallander, and his creator Henning Mankell, are interesting subjects, and Stafford Hildred’s obvious enjoyment of the books featuring the gloomy cop carries the reader through. There are introductory chapters about Mankell, and about the Branagh tv series (the Swedish tv series, which I prefer, is mentioned only in passing) but the meat of the book is to be found in the detailed accounts of the nine Wallander books published in the UK to date. A final chapter sweeps up related books, such as the one in which Linda Wallander is the central figure. This is not, to my mind, the definitive book on either Mankell or Wallander, but nevertheless it provides a readable overview of a notable crime series. Today the serial killer novel is commonplace, but arguably, its origins are to be found in Golden Age detective fiction. My Forgotten Book for today is one of the very best serial killer stories from the 1930s, X v Rex. Originally the author was named as Martin Porlock, but this was a pseudonym for Philip Macdonald. He had previous as a serial killer novelist, and I covered Murder Gone Mad in an earlier entry in this series. That story does have some merit, but I think X v Rex, which first appeared in 1933, is a superior book. The key to its success is relentless pace. The way Macdonald shifts from viewpoint to viewpoint, using very short scenes and lots of incident, is very modern. Of course, the style is dated in some ways, but for a book written 80 years ago, it has a remarkably contemporary feel. I also enjoyed the occasional shafts of wit. An example is when Macdonald offers a kaleidoscopic picture of what is going on in Britain at the time of the murders, and mentions that the publisher, Victor Gollancz, "denies that Francis Iles is the pseudonym of Mr Martin Porlock." One of the other titles given to this book, and which was used in a film version which I haven't seen, is The Mystery of the Dead Police, which really explains what the story is all about. Someone is killing cops, with a great deal of ingenuity. The killer confides in a journal, extracts from which are included, and this gives some insight into his motivation - an advance on Murder Gone Mad, in which the culprit's nature was not handled satisfactorily. Macdonald, as many of his contemporaries were doing, was learning about the craft and structure of a complex mystery through trial and error, and here he shows a great deal of flair. The journal device has been used countless times since then. Macdonald would later move to Hollywood, and work on screenplays for classic films as different as Rebecca and Forbidden Planet. His lively writing style was ideally suited to the movies, and it is equally effective in this story. The mysterious Nicholas Revel, who assists the police with their investigation, and is also a prime suspect, is a memorable character. All in all, a very enjoyable book. When I re-read it recently, I devoured it quickly and with a great deal of pleasure. Forgotten Book - Who Saw Her Die? It's a very long time since I read a book by the late Patricia Moyes. Yet the last time I read her, I really enjoyed the story- Who Is Simon Warwick? - so I was glad to receive a review copy of Who Saw Her Die?, now reprinted as an Arcturus Crime Classic, which is my Forgotten Book for today. Moyes is one of those writers - like D.M.Devine, whom I featured a while back - who was once a mainstay of the Collins Crime Club, but whose work has rather faded out of view since her death just over a decade ago. The story is told very entertainingly, and with flashes of genuine wit; Moyes wrote well. She was clearly very well travelled, and some key scenes are set in overseas locations. Henry vows to resign if he cannot solve the mystery (I'm not sure I found this convincing, despite his failure to save Crystal's life) and matters are complicated when the companion also falls victim to an apparent murder attempt. There are numerous plot twists which I thought were extremely well handled. With this type of book, you have to accept some improbabilities, but the way suspicion shifts around is cleverly done. There was, though, one concealed relationship which I didn't think was fairly clued. That quibble aside, I felt that this was a first class example of the traditional whodunit. I'll definitely read Moyes again..
Labels: Arcturus Crime Classic, Patricia Moyes, Who is Simon Warwick? Henry Tibbett, Who Saw Her Die? In common with many people, I was shocked and saddened earlier today to learn the news of the death of Maxine Clarke, whose blog Petrona has long been an outstanding resource for crime fans. There are already several wonderful and heartfelt tributes by fellow bloggers, such as Margot Kinberg and Rhian Davies, and I can only echo the sentiments they express so very well. My favourite memory of Maxine is probably of an evening when we were in the same quiz team, along with Karen Meek of Eurocrime and others, at Bristol. It was really good fun, a very convivial group. The photo of Maxine and me was taken that evening, and I'm grateful to Karen, on whose blog the shot originally appeared for permission to reproduce it here. Incidentally, the fact that our team, the Euromonkeys, triumphed that night was due in large measure to Maxine's knowledge of the genre, which was very wide. She knew more about Scandinavian crime fiction, for instance, than almost anyone I've ever met..
Maxine showed me a good many kindnesses over the past few years, which I much valued. She is a great loss, above all to her family, to whom she was clearly so devoted. A couple of people have contacted me recently to say that they have commented on posts but their comments haven't appeared. Although I moderate comments, I only exclude spam (or offensive comments, and thankfully these almost never arrive - hope I'm not tempting fate there!) So I wonder if it's a more general problem - please could anyone whose comments haven't appeared let me know? Related (perhaps) is the fact that I have received more spam comments on the blog lately (about ten a week, whereas in the past there were hardly any).. I've also noticed some unusual trends with the statistics provided by Blogger. The blog has, throughout its lifespan, enjoyed a steady increase in page views etc, but in recent times the rate of increase has been very significant. At a rough guess, I'd say page views have at least doubled in the last few months. That rate of increase, in a blog which has been running for such a long time, strikes me as surprising, and I suspect it isn't necessarily due to the merits or otherwise of the blog posts. One possible explanation is that a number of my reviews of TV shows have attracted a lot of views (many more than book reviews - though the Forgotten Books seem to do much better than review of contemporary novels), but there may be other reasons. Usually I pay little or no attention to blog stats, because I've never been sure how meaningful they really are. However,t I'm wondering if these figures suggest that the blog is attracting much more spam than in the past and if so, whether there is anything I can or should do about it. One option, which a number of wise judges among you have previously recommended, is to change to another blog hosting system such as Wordpress. I am certainly likely to consider that in 2013, but at this stage, I'd very much welcome any thoughts or suggestions on these issues that you may have. Thanks in advance. The Big Picture is a 2010 French film based on an American book, the best-seller written by Douglas Kennedy. You wouldn't easily guess that the source material is not European, so thoroughly has director Eric Lartigan put his stamp on the film. And the result is thoroughly watchable. The story-line meanders rather, but that is part of its appeal. You never quite know where it is going, and although the finale is inconclusive,it is by no means irritating. This sounds like I'm damniing the film with faint praise, but that's certainly not my intention. It's just hard to capture what it is that makes The Big Picture work - and it does work. A large part of the answer lies in the charismatic performance of Romain Duris in the lead role of Paul, one of those people who seems at the start of the film to have it all - but really doesn't. Paul is a successful corporate lawyer with a pretty wife and two children he loves. But his real dream was to make it as a photographer. However, he compromised on his real passion to earn money, giving his wife the chance to make a go of becoming a writer. But she fails to break through, and becomes disillusioned and unhappy. Paul starts to suspect that his wife is having an affair. He is distracted when his business partner (played by Catherine Deneuve) announces she is terminally ill, and asks him to take over the firm. I couldn't quite see what this development added to the story - perhaps it's more important in the novel than the film. Anyway, Paul is deserted by his wife, and sets out to confront her lover - who just happens to be a photographer. What happens next leads to Paul deciding to change his identity and pursue a new life, in a remote bit of Montenegro (I liked spotting scenes shot in Kotor, which I visited recently). At long last he is living his dream of becoming a photographer.But he becomes too successful for his own good. I really like identity swap stories, and this story of a lawyer who dreamed of pursuing his creative interests naturally held some resonance for me! An unorthodox and enjoyable film - recommended viewing..
My Forgotten Book for today is another from that talented, and genuinely interesting, writer Helen McCloy. The Impostor was one of her last books, first published in 1976 when she was in her 70s, yet it is a lively, fast-moving story, a thriller rather than a detective story, though there is a neat twist and revelation near the end. Marina Skinner has married into a rich but rather sinister family. She is involved in a car crash, and when she wakes in a psychiatric clinic, she finds herself effectively a prisoner. Dr Sander, the psychiatrist treating her, is a menacing character and a kindly nurse who tries to help her to escape herself vanishes from the clinic. The chance of escape comes at last when Victor Skinner, her husband, arrives to take her home. There is only one snag - the man claiming to be Victor is an impostor. This is a great set-up, and the story moves along in a brisk, trust-nobody fashion. Victor, it tuns out, has gone missing, and it seems that the Skinner family business is involved in research into a new and lethal form of laser. We move from a domestic type of mystery, in effect, to international intrigue, with a good deal of cryptoanalysis of a mysterious cipher thrown in. I felt the second half of the story faltered a bit, partly because I didn't find all the stuff about ciphers as fascinating as McCloy clearly did. In an afterword, she explains - with admirable honesty - that in fact she got one or two things wrong about the cipher in her story, but by the time she found out it was too late to change the narrative. This is a good example of the dangers of excessive complexity. A cipher that a typical reader hasn't a hope of decoding is, to my mind, not worth several pages of discussion, especially when otherwise the pace is excellent. However, there are enough good things in the book as a whole for me to have enjoyed it. Not McCloy's masterpiece, but an enjoyable read, cipher or no. Choose is a 2011 movie that combines many lurid plot elements with a genuinely interesting central idea - about the importance of the choices that people make in their lives. It also benefits from the fleeting appearance of that fascinating actor Bruce Dern, now a veteran, who has made a career out of playing weird guys. Here he is a dodgy shrink, whose past experiments with "choice therapy" proved ill-advised, to put it mildly. The film begins by introducing us to a nice suburban family. Unfortunately, a mysterious and deranged killer breaks into their home, and forces the daughter to choose which of her parents should die. The story then switches to a young aspiring journalist called Fiona (Katheryn Winnack) and her father, a cop who has to investigate a developing series of crimes committed by the madman. But Fiona is contacted by the madman, and decides to investigate herself. The madman's motive for his crimes, although naturally far-fetched, is well integrated into the storyline. Fiona, like one or two other characters in the film is required by the script to do some daft things - most of al when she accepts an invitation from the killer to meet him at a deserted facility that clearly has significance to him. He tells her to "come alone" - and she does. Not a good choice! One is tempted to say that she deserves her fate, although a double twist ending means that her fate is not quite what you might have expected. I found Choose to be a decent time-passer, but the "choice" theme was not explored deeply enough to make the film truly memorable. The acting was competent - Winnack and Dern, in their very different ways, are certainly watchable - and the film was wisely kept short and fairly snappy. There was just enough originality about the storyline to maintain interest throughout. It would be good, though, to see a film that made more poweful and thought-provoking use of the theme of choice. The Poison Tree, a two-part ITV psychological suspense story, began this evening and certainly proved watchable. I haven't read the book by Erin Kelly on which Emilia di Girolamo's adaptation is based (though I recall enjoying a book with the same title by Tony Strong a few years back - whatever happened to Tony Strong,by the way?) The cast is led by the memorably named (and very good-looking) trio of MyAnna Buring, Matthew Goode and Ophelia Lovibond. The story begins in the present with Kate Clarke (Buring) greeting her husband Rex (Goode) as he leaves prison after serving a 12 year sentence. We don't know anything about what he has done, but in a series of flashbacks we see the couple being introduced by Rex's wacky sister Biba (Lovibond). Rather like a pair of Ruth Rendell characters, the siblings live in a posh house, but don't work, and clearly have "issues". 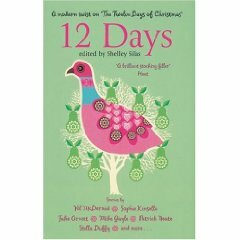 At first Biba, Kate and Rex get on swimmingly, but things start to go wrong when Kate finds out about her friends' father, a rich man who has given up on them and wants to evict them from the house. In the present day story, Rex struggles to adjust to life outside, and someone is watching him, Kate and their daughter. Rex is keeping his identity secret, but this seemed wildly optimistic from the start, and it soon becomes clear that the neighbours are suspicious Meanwhile, in the past, events move to a homicidal climax. The story is intriguing, and this is another of those thrillers that gains added suspense from a spooky Fenland setting. So it will be worth staying with it to find out what's going on (and what went on, years ago.) However, I did have reservations. First, I found it difficult to warm to any of the main characters, and consequently I wasn't as sympathetic to Kate and Rex as I felt I should have been (nor, for that matter, was I convinced by Kate's supposed Warrington accent).. Second, there were one or two aspects of the plot that seemed unlikely, even by the standards of this type of story - where, I think, one has to accept that suspension of disbelief is necessary. For instance, why on earth hadn't Kate and Rex planned more carefully how they would lead their new lives after such a long time apart, if they were so desperate to conceal his identity and what had happened in the past? Perhaps the novel covers these issues more plausibly. Or perhaps satisfactory explanations will be forthcoming in episode two. We'll see. A Touch of Larceny is a 1959 movie which remains hugely enjoyable and entertaining to this day. It is based on Andrew Garve's novel The Megstone Plot, but in the film the emphasis is on comedy rather than suspense, although there is some of the small boat sailing that features so often in Garve's work. The director was Guy Hamilton, whose later work included Goldfinger, and the cast is superb. James Mason, Vera Miles and George Sanders take the lead roles, but the minor charactes are played by such notables as John Le Mesurier, Harry Andrews and a very young Peter Barkworth. Mason, an actor I always enjoy watching, plays a rakish ex-submariner who is idling his time away in peacetime, working in the Admiralty and chasing pretty women. He bumps into an old acquaintance, played by Sanders (have there ever been two actors as suave as Mason and Sanders? I doubt it) and instantly falls for Sanders' American lady friend, played by Miles (who came to Hitchcock's attention, and had a role in Psycho). Mason wants to get rich quick, and to get Miles, and so he conjures up a scheme whereby he will appear to be a traitor, causing the newspapers to libel him. He will then reappear and cash in with compensation claims. But of course, things do not turn out to be straightforward. Amazingly, this is all still rather topical, given current debates about press freedom, and the ways in which reputations can be damaged (nowadays it's not just newspapers in the firing line, but bloggers and tweeters too.) As a lawyer, I'm fascinated by the law of libel. It does worry me that libel can be unintentional, and some compensation awards seem excessive. Equally, it's wrong to destroy people's reputations, and the law does need to protect individuals, not least those who don't have deep pockets enabling them to hire expensive lawyers. Any reform of the law needs to be focused on achieving quick solutions and the containment of cost. Anyway, back to the film. The decision to concentrate on the comedy element of the storyline is extremely successful. The story moves along at a fast pace, and there are some very nice plot twists. The actors do a great job of making the most of the material. Heartily recommended. The Department of Dead Ends is Roy Vickers' most famous book. The eponymous Department is also his most famous creation - a fictional part of Scotland Yard, presided over by Detective Inspector Rason, which collected seemingly trivial and inconsequential bits and pieces associated with unsolved cases, and every once in a while managed to interpret those stray scraps of evidence so as to pin the crime on a hitherto unsuspected culprit. Julian Symons and Ellery Queen were among the very good judges who lauded the "inverted mystery" short stories featuring the Department, and thanks to their advocacy, these stories are by far the best known of the countless stories that Vickers wrote. Is the praise deserved? I think so. There is an element of formula about the stories, once you have read several, and I think it's best to read them in small quantities. But that's true, in my opinion, of the great Father Brown stories too. You can have too much of a good thing, certainly, but I am quite clear that the Dead Ends stories are good thing. "The Rubber Trumpet", the first of the stories, is justly famous, but several others are equally good. One story is plainly based on the Brides in the Bath case, while another, the excellent "The Henpecked Murderer", explicitly references the Crippen case. I hadn't read this story before, or been aware of it, and I though Vickers used the elements of the Crippen story very cleverly to create an intriguing tale. Vickers' preoccupation with snobbery and social climbing is very evident in this collection, happily made available to modern readership by Bello - so much so that one senses he was working out "issues" of his own. The stories are very crisp and entertaining, and some of the writing - for instance, the opening paragraph of "The Yellow Jumper" - is very good indeed. This is a genuine classic. 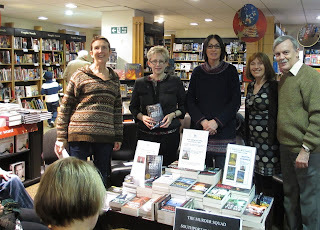 It was great fun to go back to Southport at the week-end for a Murder Squad event at Waterstones. Since the six members of the Squad are based in different parts of the North, it isn't often that we are all in the same place at the same time, and on this occasion Chris Simms couldn't make it, but it was good to see Margaret Murphy, Ann Cleeves, Kate Ellis and Cath Staincliffe again. The Squad has been doing well. Ann has not one but two TV series on the screens, with Shetland now expected to air in January. And the fact that Margaret and Cath shared the CWA Short Story Dagger for their contributions to Best Eaten Cold and Other Stories, the second and more recent of our two anthologies meant that the book sold especially well on Saturday. Southport, for readers of this blog who are unfamiliar with it, is a very attractive seaside resort, but unlike so many other seaside resorts it does not have a faded and melancholic air in winter, as it is very good shopping centre. Waterstones was certainly busy in the run-up to Christmas, and we were grateful to Sharon, for organising the event, and to Sharon's son Harry Ovenden for his excellent work as event photographer - he gets the credit for the picture that accompanies this post. Southport is where I first enjoyed literary success, when a short story I'd written won the annual writers' competition. That story, "Are You Sitting Comfortably?" later appeared in Ellery Queen's Mystery Magazine, and a few weeks later I heard that my first novel, All the Lonely People, had been accepted for publication. A happy time. And we had another enjoyable afternoon in Waterstones on Saturday before repairing - needless to say - to a local bar to catch up on everyone's news. Falcon continued with the first episode (of two) of the adaptation of Robert Wilson's The Silent and the Damned. I haven't read the novel, so I don't know whether its events follow on three months after those of The Blind Man of Seville, as in the telly version. But one thing is for sure - the entrancing photography has made me want to visit Seville as soon as the opportunity arises! In the previous story, the first victim's eyelids were removed. This time, it was the victim's tongue that was cut out. To an extent, therefore, it seemed rather as though this was an entry in a "mutilation of the month" competition, but generally, I thought this was a good crime show, pacy and yet at times thoughtful. Marton Csokas continues to excel as Falcon, and Hayley Atwell continues to appeal in the role of his potential love interest. The storyline this time was rather less clear and crisp than in The Blind Man of Seville,but one reason why that didn't matter too much was the excellence of the cast. It included Bill Paterson (who didn't make much of an effort to hide his Scottish accent when playing a Spanish character, but somehow his charisma meant it didnt' really matter) and Robert Lindsay. I've often been asked who I would, ideally, cast as Harry Devlin, and Lindsay has always been very high on the list,even though now he'd be just a little too old for the part. He really is an attractive actor, with a terrific range. I've enjoyed his work ever since he first appeared, long ago, in that breezy sitcom Citizen Smith. I finished this episode not really clear what was going on, far less having a clear idea of the culprit's identity and motive. Never mind. Falcon is, at present, proving to be rather addictive television, and it's certainly done Seville's tourist industry no harm at all. The Secret of Crickley Hall reached a suitably melodramatic climax this evening, as the third and final episode of the ghost story adapted from James Herbert's novel drew together the strands of its two story-lines, one from 1943, one contemporary. This has been a very popular show - yesterday a fellow writer whose judgment I respect was telling me how much she'd enjoyed it, and I've noted that my review of the first episode has already entered the list of the top ten most viewed of all the blog posts I've written. And since I've written over 1500 so far, that's quite something. Much of the strength of the show came from the quality of the acting rather than the scariness of the story. When David Warner, playing (for once) a good guy, met his old adversary, played by Donald Sumpter, it was a pleasure to watch two highly accomplished veteran actors at work. Suranne Jones and Tom Ellis were good as the bereaved couple who made the mistake of taking a break from their ordinary lives at a place as sinister as Crickley Hall. And Douglas Henshall was such a nasty chap as the deranged Augustus Cribben that it will be fascinating to see how he copes with the very different role of Jimmy Perez in the forthcoming series based on Ann Cleeves' books, Shetland. I wondered how the scriptwriter, Joe Ahearne, would manage to produce a "happy ending" suitable for the Sunday evening light entertainment slot without making the whole thing unacceptably twee. By and large, I think he managed to achieve the objective. That said, there were one or two elements that didn't quite work for me. For instance, the character of Cribben's dodgy sister wasn't clearly developed, and although there was an interesting glimpse of the (by now, very aged) sister in the present day that was pleasingly macabre, I'd have liked to know more about what she'd got up to since the 1940s. I've read some very negative reviews of the show, including a rather witty if withering put-down of the early family scenes in episode one ("Alfred Hitchcock doing Outnumbered"). All the same, I'm glad I stayed with it. It doesn't bear comparison with, say, The Innocents, which is still definitely unsettling 50 years on, but it was well-fashioned light entertainment. Martin Edwards’ latest novel is Gallows Court, a thriller set in 1930. He recently received the CWA Dagger in the Library, awarded by UK librarians for his body of work. He is President of the Detection Club, consultant to the British Library’s Crime Classics, and former Chair of the CWA. His contemporary whodunits include The Coffin Trail, first of seven Lake District Mysteries and shortlisted for the Theakston’s Prize for best crime novel of the year. The Arsenic Labyrinth was shortlisted for Lakeland Book of the Year. The Golden Age of Murder won the Edgar, Agatha, H.R.F. Keating and Macavity awards, while The Story of Classic Crime in 100 Books also won the Macavity and was nominated for four other awards. He has also received the CWA Short Story Dagger, the CWA Margery Allingham Prize, a CWA Red Herring, and the Poirot award “for his outstanding contribution to the crime genre”.